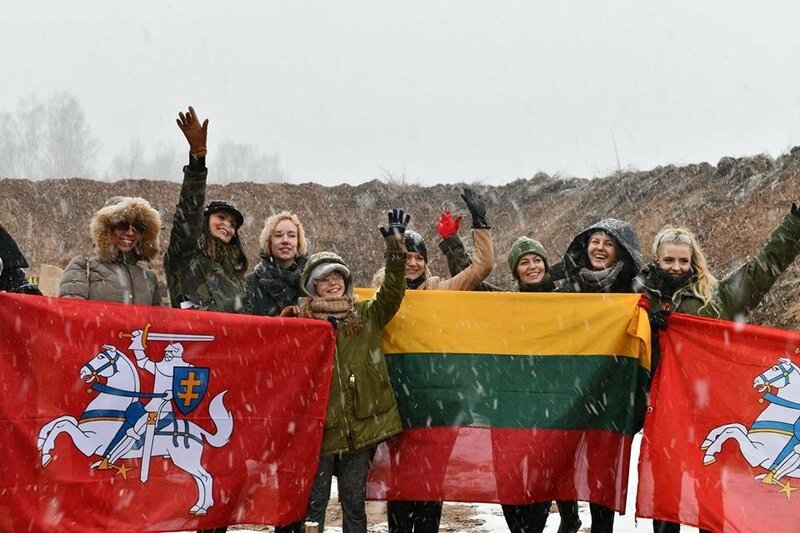 The event 101 Shots for Lithuania was held for March 11 in a forest firing range. The original celebration of the Restoration of Lithuanian Independence was held for the third year now and is becoming a tradition. Ever more female representatives from culture, business and entertainment are daring to try their hand at practical combat shooting. "Women and weapons were as if an impossible combination for me to this day, however upon trying, however, it was so exciting when I tried that it was impossible to stop. It was simpler than I expected and I did fairly well with hitting the targets. I joked that perhaps the habit of playing violin where the positioning of hands and focus are important that helped here as well," famous violinist Agnė Doveikaitė said. The idea to also put focus on the female population's preparedness for critical situations and knowledge about combat weapons is once more an important piece of news. In her book Such and Such, professor Ainė Ramonaitė pointed out a statistic: in the case of war, 50% of the country's population would not know what to do or where to start (a compilation of information about preparedness for extreme situations can be found on www.lt72.lt), 8% would emigrate and a whole 42% would take to defending Lithuania. Most of the defenders would agree to performing auxiliary functions – preparing food, sewing uniforms, establishing hideouts or acting as couriers – gathering information, transferring it to our or allied forces, those with medical knowledge would grant first aid to troops and civilians. What is curious is that only 3.4% of respondents know how to use a gun. "Some of us held a weapon for the first time in their lives. Neringa Skrupudaitė and I, who already started training in the project Tikri Vyrai [Real Men] (Thank you to Edmunas Jakilaitis for the opportunity!) are something like veterans. But when we took the guns into our hands, oh dear, how they began to shake and not only because of the cold," event, television and radio host Donata Meiželytė shared her experiences. She, alongside other participants, found this to be an invaluable experience and encounter with a different world. Singer, actor and art project initiator Agnė Sabulytė enthusiasticallt agreed, "Indeed, so many experiences! The motifs of survival also pulse in the world of art, but they are completely different... Today it was good to forget daily life and dive into a journey with a team filled with martial energy, discipline and good will!" The women celebrating March 11 in this unusual way not only got acquainted with various firearms, but also willingly shared their experiences, eating army rations at a bonfire. "Even upon recovering independence, the celebration of which fills with pride every time, we must remain wary and be prepared for the worst. It is especially important to educate the public, acquaint the people with military preparedness, firearms. By better getting to know what is perhaps somewhat frightening and untried, we will be better prepared and also safer. In the end, shooting is also a sport," project initiator Alkas Paltarokas said. During the event, the women met with instructors, who acquainted them with safety guidelines. During an initial talk, they highlighted that women, just the same as men, should obtain military preparedness and be aware how to act in extreme situations. They emphasised that it is especially important to grasp that both women and men are equally capable of defending their families and the public. The participants' acquaintance with firearms and the instruction held over the duration led to some reflection: "In daily life, you do not come to think, how many people are working so that the country's skies would be clear and sunny, so that we could calmly break bread at the dinner table and put our children to sleep in the evening without worry of war sirens. Thank you for the opportunity to look through our windows and understand what a difficult topic the security and peace of all of us is. And how many bright and thoughtful people work so that we would protect what our forefathers fought for," titled Lithuanian beauty Asta Muralytė said. Businesswoman Jolanta Sadauskienė was happy: "Let the Guns Talk. It was a unique experience and what an amazing feeling it is to nail 9 of 10 shots with an AR15 carbine right where you're aiming. The knowledge of how to use a weapon grants self-confidence. Most likely my grandfather's genes were awakened." 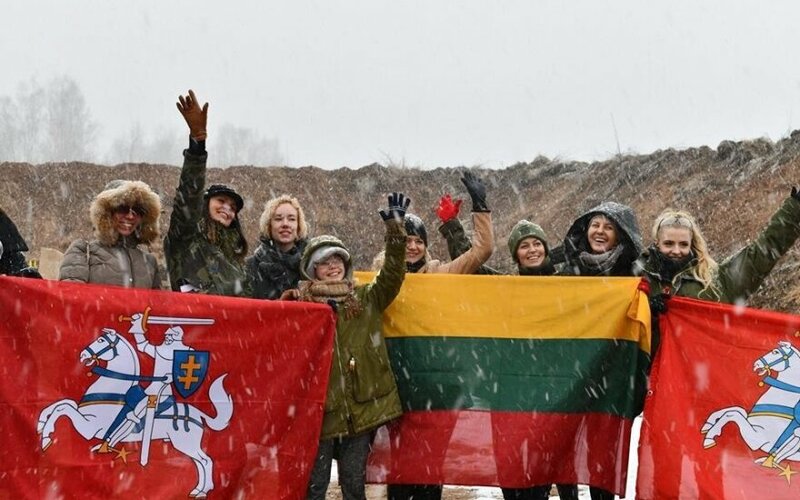 After earlier 101 shots for Lithuania initiative events, some participants were inspired by the opportunity to contribute to the country's safety and welfare and took to becoming part of the Lithuanian Riflemen's Union. Some began practicing in firing ranges. Unlike during the years of Soviet occupation, practical combat shooting is no longer taboo. It is becoming a typical activity of people valuing their freedom. This year's event participants were Karolina Toleikytė, Asta Muralytė, Daiva Breivė, Donalda Mieželytė, Neringa Skrudupaite, Jolanta Sadauskienė, Agnė Doveikatė, Agnė Sabulytė and others.